Is China coming into Syria for its "One Belt, One Road"? Is China coming into Syria for its “One Belt, One Road”? As the Syrian civil war begins to wind down after six and a half years of bitter fighting, a new phase is emerging in the battered country’s political life — plans for country’s postwar reconstruction are already being laid even as the fighting between Islamist rebels and the Syrian regime reaches a final climax in the country’s northwest. More violence is threatening to break out between US backed Kurdish rebels and Turkey, which strongly objected to American plans to create a border force out of the Kurdish dominated Syrian Democratic Forces, with which to remain engaged in Syrian politics. But though there are still tensions which could explode between the numerous factions present on Syrian soil, in the major population centres away from the fighting the thoughts of Syria’s leaders and their allies are now turning towards rebuilding the country’s shattered cities and putting Syria’s war-damaged economy back on its feet. Russia’s President Vladimir Putin has declared victory (again) in his country’s two year war in Syria, and is now appealing to the international community for funds to help restart Syria, warning that otherwise the country will remain an impoverished wreck that will act as a breeding ground for extremist groups. Meanwhile the United Nations estimates that the cost of rebuilding Syria will be at least $250bn. Rising superpower China has already stepped forwards and said that it will help Syria’s Bashar al-Assad to rebuild. Beijing has also announced that it would be sending Chinese special forces to Syria to help the regime there fight against rebel remnants. Driving by its fears over the fact that up to 5,000 ethnic Uighurs from its violence-prone far western region of Xinjiang are fighting in rebel ranks, and by its desire to include Syria in its One Belt, One Road programme, Beijing has made clear its support for the Assad regime in Damascus. Last year China even joined with Russia in vetoing UN sanctions on Damascus for using chemical weapons on its own people. 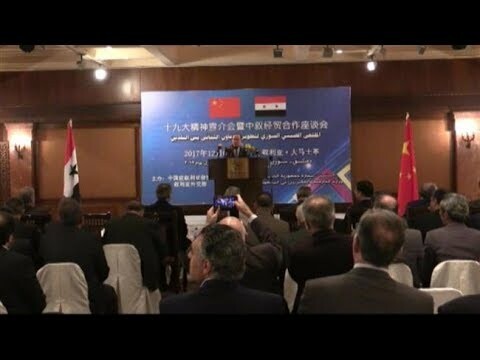 Meanwhile the China-Arab Exchange Association has said that its members have been on multiple trips to Syria to discuss future cooperation between Beijing and Damascus. China has also officially announced that it intends to cooperate with the Assad regime on funding Syria’s reconstruction efforts. Indeed, Syria is looking primarily to Iran, Russia and China for help with its reconstruction efforts, with businesses from these three allies expected to be among the biggest beneficiaries of the winding down of Syria’s civil war in most parts of the country. Assad’s forces now control all the major cities in the country, leaving the Baathist regime looking militarily unassailable. The reconstruction efforts will be a further opportunity to enable it to portray itself as the responsible, reasonable party in the recent conflict, and the participation of so many outside backers in rebuilding Syria will lend Damascus some much needed legitimacy. Reconstruction in Syria will undoubtedly be used as an opportunity by the Assad regime to punish those it deems opponents, and reward those whom it perceives as useful loyalists. Indeed its inner circle will probably profit personally from the programme, given how immense corruption was in pre-war Syria and how it continued during the war. But unlike the pre-war days, when the Assad family and an inner circle of favoured loyalists could carve up the ossified Syrian state just between themselves, this time around the proceeds will have to be shared with the countries whose military support and political cover helped the clan win the war against US and Gulf backed rebel groups like the Free Syrian Army umbrella organisation. This time the webs of corrupt patronage being spun across Syria will stretch to Beijing, Moscow and Tehran as well. The US and its European and Gulf Arab allies, most of whom backed the Syrian rebels, will continue to withhold money for reconstruction however. As the losers of the civil war, this is one of the few cards that they will have to play in the upcoming peace talks. If their diplomats stick to their guns, then this is not an empty threat however. Unlike petro-states such as Iraq, Syria itself has little ability to generate cash internally to pay for its own rebuilding; the economy is in ruins and the country’s 6.1 million internally displaced people (IDPs), many of whom escaped other formerly opposition-held areas after they were overrun by government forces, will be reluctant to go home and see what kind of future they have under President Assad. That goes double for the Syrian refugees who have made it into Europe or simply to other, more stable, countries like Turkey or Lebanon (stability being a relative term here). The EU, US and the Gulf states have put aside US$9.7bn for humanitarian aid, but have so far refused to support the reconstruction efforts without a political transition away from Assad. Meanwhile Assad has insisted that nations like Turkey and Saudi Arabia, who are angling for business despite having supported the opposition, will not be included in it anyway. Reconstruction efforts will also be hindered economically by US and EU sanctions aimed banning settlements in Syria in dollars and euros, a legacy of efforts to cut the Assad regime off from the world economy. Russia says that it has been promised contracts worth at least 850 million euros to rebuild infrastructure such as Syria’s energy facilities. Iran has been given contracts worth several hundred million euros to repair power grids, with the China-Arab Exchange Association estimating that there was about US$2bn of investment promised for Syria’s international supporters as of late last year. Nevertheless, this is only a tiny fraction of the sums that will need to be spent before the damage caused to Syria by the war is repaired. Syria will remain in ruins for years to come, as the wartime political stalemate, between Assad’s backers in China, Russia and Iran and his enemies in the US and EU, endures into the peace after it. Lacking alternatives, Chinese money and reconstruction aid will slowly come to play an increasingly important part in Syria’s internal politics, a significant change from before the war. By working through what is still the internationally recognised government of Syria, Beijing will be able to claim that it has avoided taking sides in a civil war (now nearly over) but is now engaging with a sovereign state (unlike America, which has done as much as it can from the sidelines to undermine the Assad regime). While relying on Middle Eastern oil supplies, China has traditionally avoided diplomatic entanglements there, so this support for Assad marks a shift in regional diplomacy that Chinese diplomats will undoubtedly try to conceal behind the language of non-intervention. Neil Thompson is a freelance writer who has lived and traveled extensively through East Asia and the Middle East. He holds an MA in the International Relations of East Asia from Durham University, and is now based in London. Neil Thompson is a freelance writer who has lived and traveled extensively through East Asia and the Middle East. His reporting has appeared in Forbes, The Financial Times, The Independent, Informed Comment and the New African, among others. He holds an MA in the International Relations of East Asia from Durham University, and is now based in London.